Today’s students are expected to have some typing proficiency as early as kindergarten. Our students, for example, must be able to, at minimum, type their first and last name in order to access their devices and accounts. Our 2nd-5th graders take computer-based assessments which require them to type constructed responses to questions. Learning to type is not an option for our students; it’s an essential skill! Differentiated Lessons and Gaming Make Keyboarding Fun! Younger students come into my lab barely knowing their letters, but by the time they’re through my curriculum, their skills have dramatically improved. Using engaging and scaffolded games allow pre-readers and early learners to dip their toes into the keyboarding “pool” and learn at their own pace. I use TypeTastic with my K-2 students, and there’s no doubt the gamification of learning a new skill works. With my kindergartners, (and even some 1st-graders) I start off with Keyboard Builder, Cupcake Bugs, and Frog Pond Patrol. These games strengthen students’ mouse skills, while also introducing them to the layout of the keyboard. These games are building their letter recognition skills and helping them to understand the concept that the keyboard has its own specific layout. As the weeks progress, we begin moving into locating letters on the keyboard. Again, with my kindergartners, the focus is less on proper technique and more on locating letters. They love playing Astrobubbles and Letter Trucks. These games are ideal because they’re not timed, which keeps my little ones engaged for longer. They’re not frustrated because they couldn’t find the key “in time.” The games make kids feel like they’re “winning” even when they make mistakes. Students are given as many tries as they need, without penalty, which is HUGE in getting my reluctant learners to stick with the task and not become overwhelmed and frustrated. First grade is when we introduce the home row and ask students to begin locating and identifying those keys. 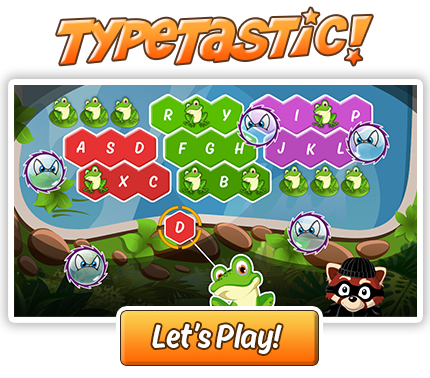 TypeTastic has games like Astrobubbles, Ducky Trouble, and Letter Trucks that help students build their skills. When students reach 2nd grade, we expect them to start mastering the home row and use the proper technique. The tutorials offered at the start of the Keyboarding Kickstart module remind students of the technique they should use when typing. One of my favorite parts of being an educator is watching students challenge themselves and learn. As I mentioned, we introduce the home row in first grade. I show them where to place their fingers using a document camera, then send students to their own computers to try it themselves. Managing the home row is quite a task for those little fingers. In 1st grade, students are still developing the fine motor skills and dexterity to get their fingers matched up on the right keys. After I showed my 1st-graders the home row this year, I stood back and watched as the room went from furrowed brows, tongues sticking out of the corners of mouths, and utter concentration, to expressions of sheer delight! I watched them celebrate their success as their determination and perseverance mastered level after level. They were not discouraged when they made a mistake, and were not overwhelmed by the speed of the game. The kids were thrilled with all of the stars they’d earned and couldn’t wait to move on. The beauty of TypeTastic’s differentiated nature is that my kiddos who are still developing the dexterity to touch type can still be working on their typing skills while my kids who are ready for keyboarding are able to continue practicing their technique. Each kid is able to self-evaluate, giving them the power to move to a game that matches their ability level while meeting the objective for that day. Bethany Nill is the technology teacher at Mid Rivers Elementary in Saint Peters, MO. ← Happy Holidays from the TypeTastic Team! A gift for you! How do you have each student sign in and it keep their progress?